Well, here I am, enjoying Frette linens and Bulgari bath goodies. It’s called working. I’m attending a conference at a historic hotel, the Langham, in Pasadena. 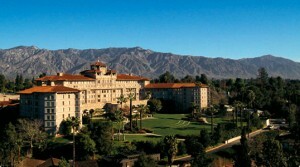 Built in 1907 and formerly the Ritz-Carlton, it sits grandly beneath the San Gabriel Mountains. It also has the best room service coffee I’ve ever had. It almost made up for whatever East Coast Idiot called me at 6:30 this morning, disturbing my much-needed beauty rest. Getting here was, of course, an adventure. I got up early, even without the aid of an unwanted and unsolicited phone call. Called for a cab an hour before I needed it. It didn’t show up. Called again 10 minutes after it was due to arrive. I was told it was on its way. Several increasingly irate phone calls later, the cab finally showed up. It was 9:10 and the plane left at 9:47. I chucked bags and Self unceremoniously into the back seat of the cab, while the driver hung out in the street with the door open, blaming the cab company for his being late. I suggested that we GO, since I was almost certainly going to miss my flight. Visions of $150 change fees on a $200 ticket danced in my head as he finally turned on his GPS and started entering in the address. Yes, I had drawn possibly the only cab driver who didn’t know how to get to the airport. Having only recently been there myself, I started directing him. And corrected him when he turned the wrong way (twice). And ran into the terminal, panted through Security (my obvious panic apparently not making me look one bit suspicious) and to the gate. A kindly lady asked, “Are you Susan?” as I wordlessly thrust my boarding pass at her. She smiled and told me not to worry, she was just going to page me and they wouldn’t leave without me. I hustled onto the plane, which was approximately the size of my car, and as I sat down, the door slammed behind me. I was the cynosure of all eyes as I attempted to hide behind the latest issue of “Us” magazine. Forty-five minutes later, I was at LAX, which was disappointingly free of celebrities. There went my hopes of being on TMZ. As I took the shuttle to the rental car place, it occurred to me that I spent longer waiting for the cab than flying to LA and picking up a brand new silver Impala (which is currently napping in valet parking. I love valet parking, even though they just took the car 50 feet away and there is endless tipping involved. It’s worth it just to have cute, smiling boys open the car door for you and close it after you as if it’s the most delightful thing in the world). From what little I’ve seen of Pasadena, it is beautiful and full of houses that vary from enormous to mansion sized, in a tropical setting. It’s supposed to be 95 degrees today. Just right for lunch beside the turquoise pool. I wish it had been 95F in Vegas when I was there. Instead it was FREEZING!